This kit is an advanced figure kit for a jointed doll. The kit is for the advanced modeler and needs quite a bit of work to complete. This web site will detail my efforts to complete this kit. I have not attempted anything like this before and cannot read Japanese, so with help with translating the instructions and working slowly, I hope to end up with a lovely jointed 22" resin doll. I will add photos to this site as I complete that portion of the kit. The kit is ordered from Japan and costs 30,000 yen (aprox $350) It arrives with most of the parts necessary to complete the doll figure, including the wig. 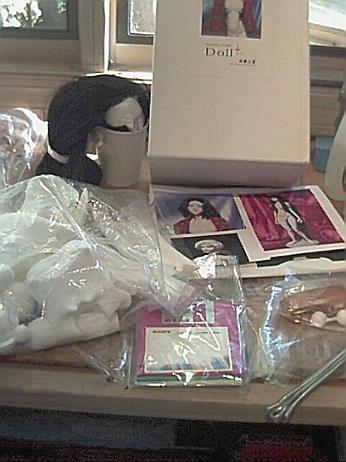 The kit consists of 38 separate parts in a plastic bag, the head (with long black wig glued on) aluminum wire, large rubber band and 4 pages of diagrams and instructions in Japanese. Also included are 3 floppy discs with photos of completed dolls. 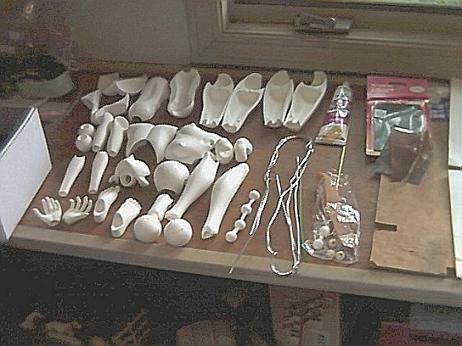 To begin, I sorted out all the parts and layed them out on my worktable to make sure all the parts were there and to study them to see what connects to what. The resin kit is rough and needs to be sanded, primed and completely painted, as it arrives as "raw" white resin with mold marks. There is work to be done before painting the pieces, however. Clik on the following pages to view each step to completing this kit, beginning with the torso parts. I will be adding pictures as I complete each part of the kit, so check back for updates.